The maps depict the changes in the small coastal village of Felixstone between 1967 and 2001. Overall, land use was repurposed from one of agriculture and fishing to one of residence and recreation. In 1967, the village of Felixstone was surrounded mostly by farmland to the east and beachfront to the south. A few shops lined a small high street with fishing facilities, a fish market, hotel and café along the shore. A large golf course additionally existed in the west. By 2001, much of the surrounding land had been repurposed to modern needs. Although the golf course still remained, apartments lined most of the high street. Farmland to the east had been replaced by a holiday resort with a private beach where the fish market once stood. Along the rest of the beachfront, except for the café, there were further changes. The marina had become a public beach while the small hotel had a car park built alongside. Meanwhile among the dunes, wind turbines had been constructed to power the new developments. Describe the major changes in the village over time. Use locational phrases and prepositions to order your writing. Describe the original village so you can highlights changes in the next paragraph. Remember to use past tense in both body paragraphs. Decide during the planning stage on the order of information that you’re going to give. Show the overall change. Give specific changes. Contrast with the preceding paragraph. Use sufficient linking devices to highlight the changes. Past perfect is used to describe the changes as occurring at some point in the past before 2001 (also in the past). Don’t use past simple. 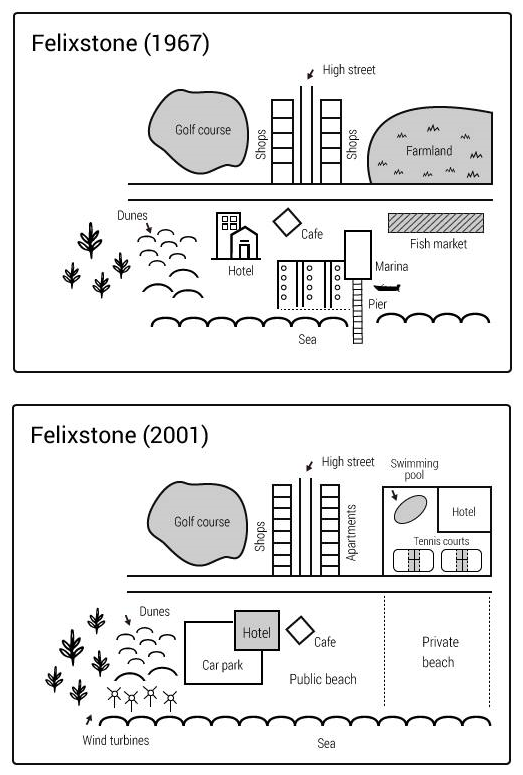 The map depicting the changes in small coastal village of Felixstone between 1967 and 2001. Overall land use has been repurposed from one of agriculture and fishing to one of residence and recreation. In 1967, the village of Felixstone was surrounded mostly farmland to the east and beachfront to the south. A few shops lined small high street with fishing facilities, fish market, hotel and café along the shore. Large golf course additionally exists in the west. By 2001, much of the surrounding land had been repurposed to modern needs. Although the golf course still remained, apartments lined most of the high street. Farmland to the east had been replacement by a holiday resort with private beach where fish market once stood. Along the rest of beachfront, except for café, there were further changes. The marina had become public beach while small hotel had car park built alongside. Meanwhile among the dunes, wind turbines had been construct to power the new developments.